The hockey world and the Dallas Stars press wire are buzzing this morning with a few different stories. 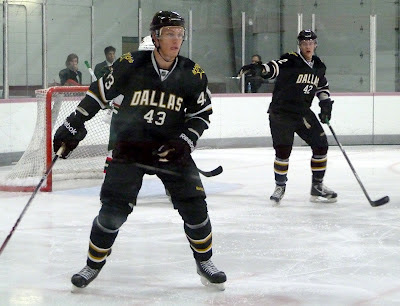 First of all, last night Dallas announced the schedule and roster for Stars Development Camp. Camp will be held next week, July 5-12 in Frisco, Texas. The full roster, which can be found here, comprises 40 players, including nine goalies. It would seem unusual to have that many until you notice the note at the bottom of the roster indicating that media availability with Jack Campbell, Christopher Nihlstorp and Tyler Beskorowany must be specially requested. To me, this means they will be off doing some special activities with goalie coach Mike Valley. I plan to attend development camp and talk with some of the newest Stars. Second, Mike Heika broke news yesterday that, as expected, the Stars bought out Eric Godard's contract. Godard was brought on as an experiment as the team "tough guy". In the end, he played 0 games in the NHL last year and was often a healthy scratch with Texas. He tallied one goal and 58 penalty minutes in 46 games played. Godard's contract switched over to one-way next season, and the Stars were not anticipating him making the NHL roster or being a useful piece at the AHL level. His buyout cap hit is $258,333 next year and $233,333 in 2013-14. That's nothing in comparison to the hypothetical $70.2 million salary cap for 2012-13. In all, it's most fair to everyone. Godard wasn't being used in the Dallas system and deserves a chance to move on elsewhere. For Dallas, it frees up one of their 50 contracts to give to another player. Only one of those has re-signed, Francis Wathier. On the list of players I don't expect to re-sign, I would include Andrew Raycroft, Ray Sawada, and Dan Spang. Unfortunately, I also do not believe that the Stars are targeting Brad Lukowich. In questions about veteran players and signings with Scott White, Lukowich was not in the conversation. As to veteran D, Texas is targeting Maxime Fortunus. Fortunus's AHL salary was 150,000, making him the highest AHL salary other than Brad Lukowich. That $150k is already pretty high for an AHL salary. I believe Fortunus may test the free agent market on July 1st, just to see what's out there. 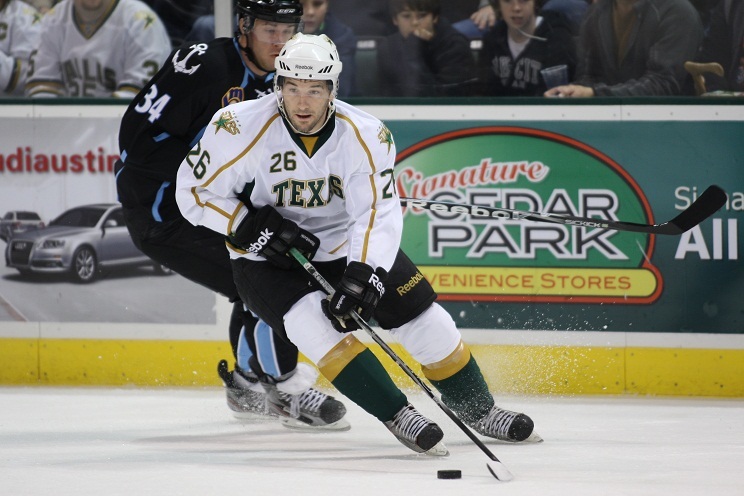 On the Texas free agent list still are Nick Layton, Stephen Schultz and Shawn Weller. Schultz is the only one on this list that I would think is a possibility to sign. However, when you look at who's already signed and who is coming from juniors, there isn't a lot of roster room left. Could Schultz be added on an AHL/ECHL two-way to provide depth for the roster? I think that's the most likely way for him to play for the Stars this season. The AHL's Board of Governors meetings concluded today and the league announced numerous changes to the league coming out of the meetings. The headliner for many NHL fans is the addition of hybrid icing to the AHL game. As a possible precursor to addition to the NHL, the AHL will be testing the rule. The Board has also approved a test of a variation on Rule 81 (“Icing”) at the request of the National Hockey League, that will, in the event of a potential icing violation, complete the play should a defending player be the first to reach the end zone face-off dots and provided the puck has crossed the goal line at that point. This rule will be in effect until Nov. 19, 2012, at which time its continued use will be determined by the Board. This was the only rules test approved. I'm interested that the rule will change, potentially, one month into the season. This rule has the potential to reduce dangerous collisions in the race for a puck at the goal line. I hope it is successful. The headliner for AHL fans is the addition of video review to the league. According to Kevin Oklobjiza of the Rochester Democrat and Chronicle, "[one] camera, above net, referee is judge, replay controls at ice level, monitor in penalty box (as in college). 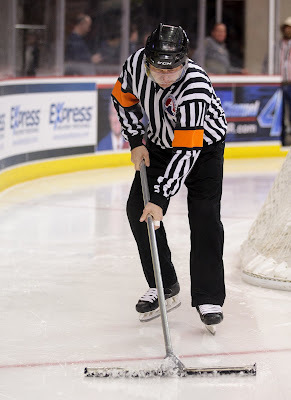 #AHL video review is totally referee's discretion. Coaches can't demand review. Likely won't be able to use TV/in-arena cams for extra view." The reaction has been overwhelmingly positive to the announcement from players to fans to even goal judges. Elsewhere, Texas "changed" divisions as the AHL renamed the West Division to the South Division. The Stars are joined in the division by Houston, San Antonio, OKC and Charlotte. Charlotte left the Midwest and moved to the South, displacing Abbotsford. Stars players have to be happy about that. Texas usually flew into Seattle to avoid costly international flight travel and bused to Abbotsford. On the other hand, no Timmy's coffee in Charlotte, so there's that. • Rule 67.2 (“Handling the Puck”) now calls for a minor penalty “any time a player places his hand over the puck while it is on the ice in order to conceal it from or prevent an opponent from playing the puck”. • Rule 76.4 (“Face-offs”) states that “both players facing off are prohibited from batting the puck with their hand in an attempt to win the face-off.” Violation of this rule will result in a minor penalty for delay of game. Final thing to note, the AHL also announced today that the season will end on April 20th this season, five days later than this year. For comparison, Kevin O. reminds us, "In 1957, the Amerks lost final game of Calder Cup finals April 17." The NHL draft begins this Friday in Pittsburgh, and the Dallas Stars have a boatload of picks with eight total through the seven rounds. If you're picking outside the top 10 selections or so, the NHL draft is very much about delayed gratification. Some of the top players in the draft this year, like Nail Yakupov, the consensus number one pick, will play in the NHL next season. Otherwise, it's the long slog through juniors and the American League before eventually making the show. So when do the 2012 draft picks start filtering up to the Texas Stars? One of the best ways to figure this out is to start seeing when the current players for the Texas Stars were drafted. We did this for the 2010-11 season here. As in that post, here is a look at the players who were originally drafted by the Dallas Stars organization and are expected to play for the 2012-13 Texas Stars. Aside from veteran leadership in Francis Wathier, all of the players coming on next year's squad are 2007 draftees or later. Two of those 2007 guys, Sceviour and Gazdic, are just finishing up their ELCs this summer and were extending qualifying offers yesterday. Austin Smith, who took five years between draft and entering the pro ranks, is just getting started on his first ELC. You'll see as the year gets higher, the round gets earlier. The earliest we could expect a 2012 draft pick in Texas would be 2013-14. This is only in a very special case, however. There are a lot of rules around when players may leave juniors. Jamie Oleksiak got lucky because he was drafted out of Northeastern, not the junior system. He was allowed to only play one year in the OHL before leaving to go pro. By and large, those picks from 2012 that do make it to the pro ranks will not start to filter in until 2014-15 with the majority of them coming in 2015-16 and beyond. So take note of some names on Friday, but don't expect to see them on the backs of jerseys at the CPC anytime soon. The Stars did not extend QOs to Angelo Esposito, Mikhail Stefanovich, Michael Neal and Jake Hauswirth. The chief RFA concern for the Stars is Jamie Benn, who will not get one of these one-year contracts, but instead a longer term deal. Notably absent is Tom Wandell, who the Stars have not yet made a decision on. Philip Larsen is also absent from the list but is expected to get a deal done. Teams have until June 25th to extend qualifying offers. The players extended QOs are not surprising. The only one that was on the fence was Esposito, and while he played well in the back half of the season, he needed to show more to earn a roster spot. When you've got a fifty contract limit and some highly touted prospects entering the system, you can't take a contract and roster spot up with a player who has not shown he is going to play in the NHL. Hundred Degree Hockey has learned that the Texas Stars have re-signed forward Mike Hedden for the 2012-13 season. Hedden, who is going into his fourth professional year, was signed to an AHL contract by Texas. Hedden surprised many as he collected 34 points last season, bouncing from the first line to fourth line throughout the season and producing at every turn. The Neumann College product is looking to build on that first season, as Texas Stars GM Scott White alluded to. "Mike is an AHL contracted guy who had a good year last year. And now the goal is to follow up that year with another good year on a team that has overall better results." White felt that signing Hedden as a veteran player was an important part of the puzzle for Texas. "I'll take less individual statistics and more team points and I'm sure Mike would as well. He'll complement our young guys well." Along with the signing of Francis Wathier, Texas is working to solidify a veteran core to support the numerous first-year pros on the team, many of whom joined the team for amateur tryout stints this past spring. White led me to believe that the team is still working on several veteran signings. Most of the staff's time for the next week or so will be consumed by the NHL Draft, taking place next weekend in Pittsburgh next weekend. GM Scott White introduced Willie Desjardins as the new head coach of the Texas Stars in a press conference this morning at the Cedar Park Center. In a summer of change for the Texas Stars, nailing down the head coaching position was priority one for Joe Nieuwendyk and Scott White. Yesterday, the Stars announced Willie Desjardins as that new coach and held a press conference today to introduce him to the Austin media and fans. For Dallas, Desjardins represents a known commodity and one they value very highly. "The familiarity with Willie was huge in the decision," said Scott White. "Joe Nieuwendyk and Les Jackson talked about that familiarity. More importantly, the structure that we want to play with and return to is also part of it." Both Coach Desjardins and White mentioned structure and systems alignment in their opening remarks and were later asked about it by the assembled media. It was a sore point last season and was definitely a focus point in this hire. Desjardins addressed it head on, "I think there's lots of similarities in what we'll run, which is good for the organization with players moving back and forth." Dallas head coach Glen Gulutzan, who was on-hand for the press conference, agreed. "One thing that I've been asked about is the same systems. Whenever you have continuity in the organization, it makes it easier. Willie has the ability to adapt to fit the personnel. Our philosphies are the same, and it's going to be very similar." Desjardins did not get many opportunities to come visit Austin during the past season but heard rave reviews from the Gulutzan and Jerrard families and couldn't wait to bring his family to Central Texas. That connection to Gulutzan is highly prized by Texas GM White. "Ultimately, Willie wanted to be a head coach again. We're getting a bonus because he's worked with Gully." Desjardins' experience as a head coach in the WHL for the Medicine Hat Tigers is a big positive for the Stars. "When you work at the junior level, you work with younger players and everything's kind of ahead of them. You look at Matt Fraser. I tried to get him to Medicine Hat and didn't get him. We never expected him to progress the way he did. That's the exciting thing about working with young guys; you just don't know where they can get to. It's about how hard they want to work." While development is a huge part of the Desjardins hire, the team knows that the fans are hungry for another run at the Cup. The team's new head coach has a history of winning championships in the WHL and wants to bring that tradition to Cedar Park. "We want to play an exciting brand of hockey, and this is a good group to do it with. We want to get to the Calder Cup, for sure. Watching L.A. celebrate on TV, how great of a celebration was that? That's what we want to get to." Big news in the free agent market today for Texas Stars fans as Dallas announced the re-signing of Francis Wathier to a two-year deal. The club locks up a veteran forward with the signing and ensures some forward stability for the young club. Wathier is coming off a career year in terms of assists and points. He also gets a lot of credit for the growth of the game of Scott Glennie this past season while being grouped with him on a line with Colton Sceviour. With Texas's veteran situation up in the air due to free agents Brad Lukowich and Maxime Fortunus possibly leaving, this is a great signing to ensure that there will be another experienced voice for the forwards in the room. If Brad Lukowich does not re-sign, I would not put it out of the realm of possibility that Wathier earns the captaincy of the Texas Stars. The Dallas Stars announced today that the club has signed forward Francis Wathier (wa-tee-ayh) to a two-year, two-way contract, for the 2012-13 and 2013-14 seasons. I spoke briefly with Texas Stars GM Scott White this morning about new goalie Josh Robinson and the state of Texas's goaltending. White indicates that Robinson's contract is not signed yet, but they have agreed to terms. Robinson is a depth signing for the team, and White expects that he will be assigned to the ECHL and not the CHL's Allen Americans. 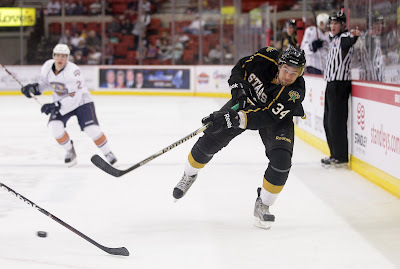 It is unclear whether the ECHL means Idaho or another team in the league. Depending on what happens with Beskorowany, Bachman and Nihlstorp, Texas could need to assign Robinson or Beskorowany to an ECHL club not named the Steelheads. 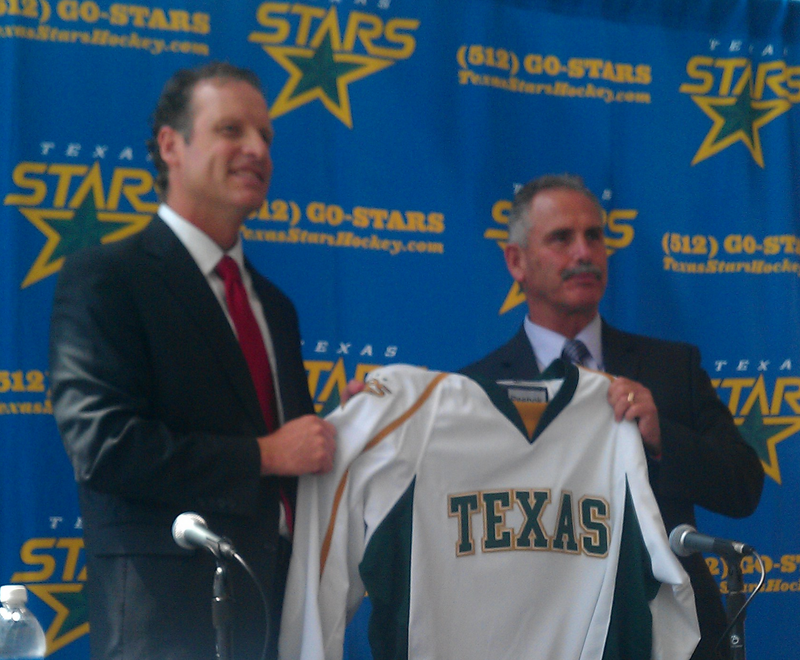 On other fronts, White indicated that AHL contract signings will have to wait until after NHL free agency for Texas. Players like Mike Hedden and Stephen Schultz highlight the list of players on expiring AHL contracts for Texas. White also said that he expects a quicker timeline than last summer on the coaching hire. Separately, Mike Heika wrote today that the Stars are in active talks with Dallas associate coach Willie Desjardins about becoming the head coach of the Texas Stars. Desjardins has a solid history as a head coach in the WHL with Medicine Hat. Jace Coyle and Tristan King both played for him during his tenure there.